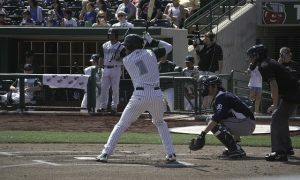 If you follow Major League Baseball even casually, you have undoubtedly heard the term Five-Tool Player used by a play-by-play announcer or color commentator to describe a well-rounded player. The term has even become so ubiquitous that it has its own Wikipedia page. If it is not a term that you are aware of though, it is a very simple concept: It is used to describe a player who is above average at hitting for both average and power, at running the bases, and at both fielding the ball as well as throwing it. Now that we’ve established what the tools are, let’s look at one man’s (my) opinion as to who cracks the top ten best five-tool players in MLB history. Vlad the Impaler was best known for two unique attributes; his free-swinging style at the plate and his rocket arm from the outfield. Though it is almost hard to remember now, Guerrero was a very good defensive outfielder when he was younger. He committed too many errors, but also regularly led baseball in outfield assists. Historically speaking, his fairly early move to DH due to injuries and lack of Gold Gloves hold him back a bit on this list, but at his peak, he was far from a slouch with the glove. Where he really shined though was at the dish. Vlad finished his career with a .318 average and 449 homers. For a man who swung at almost anything, his average was incredible. When his athleticism started to leave him, his steal totals left along with his glove. Still, he was in the top ten in steals in both 2001 and 2002. The relative short length of his prime compared to other players gave me a little pause but I still feel like his peak was long enough to deserve a spot here. This choice for the Top Ten might be a little controversial, but I decided being elite in four out of five categories was better than being very good in all five. By the time Ichiro made his way to the Major Leagues he was already 27 years old and a legend in his native Japan. All he managed in his first MLB season in 2001 was winning the American League Rookie of the Year and Most Valuable Player in the same year, a feat only matched by Fred Lynn. He also led the AL that year in both stolen bases and batting average. No one had led both categories in his league since Jackie Robinson. It was truly a season for the ages. While Ichiro slowed down a bit from there, he still used his great glove and stellar arm to rack up a Gold Glove award every year from 2001-2010. 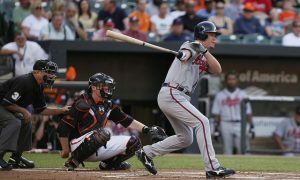 He also earned All Star Game appearances every season from 2001-2010, a second batting title, three Silver Sluggers, holds the single season hits record, led the AL once in steals, has more professional hits globally than any player in history and several other accolades. There are two reasons he is not even higher on this list. First of all, he missed several potential peak seasons when he played professionally in Japan. Secondly, he only has hit 115 home runs. Still, his stratospheric impact in the other four categories in his first decade in MLB is enough for this list in my book. Versatility was the name of the game in many respects when it came to Dave Winfield. Perhaps the most oft-quoted trivia about his career is that he was drafted by four professional sports teams in three different sports. While that fact is undoubtedly impressive, I wonder if it slightly obscures some of his accomplishments from his MLB career. Though Winfield ended his career as a Designated Hitter, he was an excellent fielder when he was younger, collecting seven Gold Gloves with a blend of athleticism and a strong arm. At the plate, he racked up six Silver Slugger awards and walloped 465 dingers over the course of his career. The main thing holding him back on this list (other than the sheer excellence of the next seven players) is that he stole over 20 bags only five times in a season. That being said, he still managed 223 steals in his Hall of Fame career. What makes a list like this one difficult is attempting to compare players from wildly different eras. I knew I would have Cobb in my Top Ten, but it took me quite a long time figuring out where on this list to slot him. Ultimately, the seventh spot made the most sense to me. Cobb’s hitting stats are undeniable. He has the highest batting average in history and held the record for most career steals until the 1970s. Awfully impressive for someone who retired in 1928. However, this list ranks the greatest five-tool players. Cobb holds the record for the most errors ever by an American League outfielder. He also only hit 117 career home runs. Of course, there was not much power in baseball until 1920, but that still feels low considering how many home runs Babe Ruth hit in somewhat overlapping careers. The greatest ever average hitter will have to posthumously settle for number seven on this list. Perhaps the greatest switch hitter of all-time, Mickey Mantle lands at number 6 on this list of the best Five-Tool players ever. Mantle was known for many things, including: His legendary embracing of the New York nightlife during his playing career, winning seven World Series and three Most Valuable Players, and also being prolific at hitting for both power and average. Mantle mashed 536 homers over the course of his career, including narrowly missing out on the single season home run record in 1961. He also hit for over a .300 average in 10 seasons and finished his storied career with a .298 average overall. Considering he was patrolling a Gotham center field at the same time as Willie Mays, his defense was a bit overlooked. That said, Mantle managed a very strong 0.984 fielding percentage as a center fielder. The main “tool” he did not excel at was base stealing, but he did have one 20/20 season, in 1959. One of the most consistent players in Major League history checks in at sixth on the list. Hammerin’ Hank’s biggest claim to fame is of course breaking Babe Ruth’s all-time home run record, then subsequently having his record usurped by Barry Bonds under suspicious (to say the least) circumstances. That said, Aaron’s career was about much more than home runs. While Aaron was known more for his bat than his glove, he was a three-time Gold Glove winner as a right fielder. He finished his career with a healthy 240 stolen bases, including a career high 31 in 1963. That season secured his inclusion in the 30/30 club, as he also socked 44 dingers that same season. Finally, his career average was a very good .305 and he piled up over 3700 hits. Aaron was an extremely well-rounded player who also happens to have the second most home runs of all-time. Oh, A-Rod. One of the most gifted and controversial ballplayers of all-time. Rodriguez made his debut in the Majors as an 18 year old with the Mariners in 1994, but became a superstar in Seattle in 1996. He won his only batting title that season with a .358 average. He kicked in 36 home runs as well, and became the youngest shortstop in All Star Game history. Not bad! 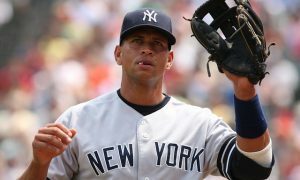 By the end of his career, he would also be known for failed steroid tests and the lies he told about them, illegally swatting a ball from Bronson Arroyo during the Yankees collapse in the 2004 ALCS against the Red Sox, and a strained relationship with Derek Jeter, the captain of his very team. Not great! All that said, he was one of the greatest Five-Tool players ever. Before he aged and also artificially enhanced his body beyond recognition, he was a tremendous base stealer in addition to his prodigious power. The best display of this was his 40/40 season in 1998, one of only four men to ever accomplish that feat (including the legendary Jose Canseco!). Though his fielding lagged behind his batting, he still managed to snag a couple of Gold Gloves along the way as well. Through, and despite, it all, over 3000 hits, 600 home runs and seemingly endless embarrassing headlines later, he winds up at number four on this list. As a Minnesota Twins fan who was born in 1986, Kirby Puckett was my favorite player growing up. That said, Ken Griffey, Jr. was the signature player of my childhood. In his prime, Junior made the game look both easy and cool to a greater degree than anyone else I’ve ever watched. His effortless swing is legendary and his highlight-reel catches were a norm on SportsCenter. Lest you think he was all style, how is this for substance: Griffey won 10 consecutive Gold Glove awards, was a 13 time All Star, won an American League MVP in 1997, was a seven time Silver Slugger and the fact that he socked 630 career home runs now feels like a disappointment considering the torrid pace he was on for the first half of his career. 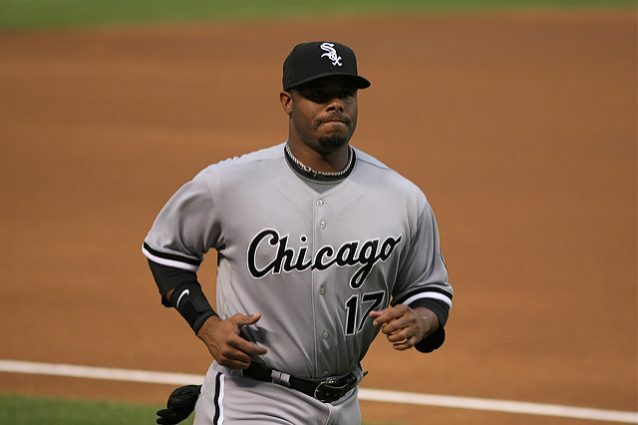 Although Griffey was incredibly athletic, he never was a huge base stealer, only getting over 20 stolen bases twice in a season, finishing his career with 184. Injuries robbed Junior of the back half of his peak, but his career will never be forgotten. Griffey may have been the signature player of the 1990s, but Barry Bonds was the best player of that era. Before his head started literally growing and he took down the two most important records in the sport, he was an incredible all-around player. He became a member of the 40/40 Club in 1996 and was a three-time NL MVP by the age of 29. Although his defense was always a bit behind his offensive production, he also netted himself eight Gold Glove awards. His arm strength was average, but he did lead the NL in outfield assists in 1990. Unfortunately for Bonds, the most memorable throw of his career was not a good one, on Sid Bream’s famous game-winning slide. The prevailing rumor has always been that Bonds turned himself into the Incredible Hulk after his great play in 1998 was virtually ignored as the baseball world turned its attention to the McGuire/Sosa season long home run derby. It is certainly a theory that holds water. Even if you throw out everything Bonds did from 1999 onwards though, he still has over 400 home runs, over 400 steals and those three early MVPs. Considering the entire era he played in is under a cloud of suspicion, I have to put him here on my list. The Say Hey Kid was the greatest all-around player in Major League history. Power? He drilled 660 home runs over the course of his career. Average? Even considering the fact he tailed off quite a bit towards the end of his career, he still hit at a .302 lifetime clip. Steals? A cool 338 for his career, including a stretch from 1956-58 where he went 40-38-31. Fielding? He was perhaps the greatest outfielder who ever lived, combining speed with a tremendous arm to win 12 Gold Gloves and he would have won more if the award had only been invented before 1957. He also made the most iconic catch in baseball history. What more can you say other than hey, Mays is the greatest Five-Tool player of all-time.